YEREVAN (Combined Sources)–The North Atlantic Treaty Organization on Monday wrapped up its three-week long "Cooperative Longbow/Lancer 2008” training exercises in Armenia with a closing ceremony that highlighted the resounding success of the exercises, which involved hundreds of personnel from the alliance and several ex-Soviet bloc nations. NATO’s special representative to the Caucasus and Central Asia, Robert Simmons, was in Yerevan on Monday where he met separately with Armenia’ President Serzh Sarkisian and Foreign Minister Edward Nalbandian for discussions on Armenia’s foreign policy, the Nagorno-Karabakh conflict, and the move to normalize relations with NATO member Turkey. Simmons said NATO welcomes and supports Armenia’s initiative and resoluteness to normalize relations with Turkey. During their meeting, Sarkisian and Simmons discussed security and stability in the region, the latest developmen’s in the push to normalize relations with Turkey and Armenia, and the ongoing Nagorno-Karabakh peace process, which has seen increased activity and attention since the outbreak of the Russian-Georgian conflict. Simmons praised as a success the three-week training exercises in Armenia, which began on September 29 and included the participation of hundreds of personnel from the alliance and several ex-Soviet bloc nations. He also conveyed NATO Secretary General Jaap De Hoop Scheffer’s assessmen’s of Armenia’s ongoing cooperation with NATO, calling it “very successful” and a “good precondition” for developing relations. Sarkisian, for his part, said that closer ties with Europe remain one of Armenia’s foreign policy objectives, and cooperation with NATO is a core component to that policy. According to the Armenian President, Yerevan’s cooperation with NATO will continue, as it as an essential factor in Armenia’s national security. Simmons also met Monday with Foreign Minister Edward Nalbandian for talks on Armenia’s cooperation with NATO through its Individual Partnership Action Plan. Nalbandian briefed Simmons on the current state of the Karabakh negotiations and any new opportunities for solving the issue. The two also discussed the latest developmen’s in the region. Later in the day, Simmons took part in a town hall style meeting with students from the Yerevan State Linguistic University. During the event, Simmons discussed NATO’s position on the Nagorno-Karabakh conflict and regional security. The Nagorno Karabakh must be solved peacefully, he said, noting that the “issues” should be solved by Armenia and Azerbaijan. “External forces” can only advise in the process, he said. Simmons also described Armenia’s cooperation with NATO as “very important,” citing the fragile situation in the region that has developed following the Russian-Georgian conflict in August. “This [NATO-Armenia] cooperation should be put on a firm basis, continue and develop it,” Simmons said, noting the “real progress” seen during the Lancer/Longbow War Games in Yerevan. According to Simmons, the NATO exercises will help Armenia’s army be more organized to manage and effectively act in crisis situations. The military exercises, he continued, will also contribute to the peace and stability in the region through multinational cooperation. Simmons also emphasized that individual and regional cooperation with NATO does not exclude its cooperation with other structures and alliances. Meanwhile, Armenia’s Defense Minister on Sunday met with a NATO delegation headed by the Commander of the alliance’s North Regional Land Troops, General-Lieutenant Roland Cater. 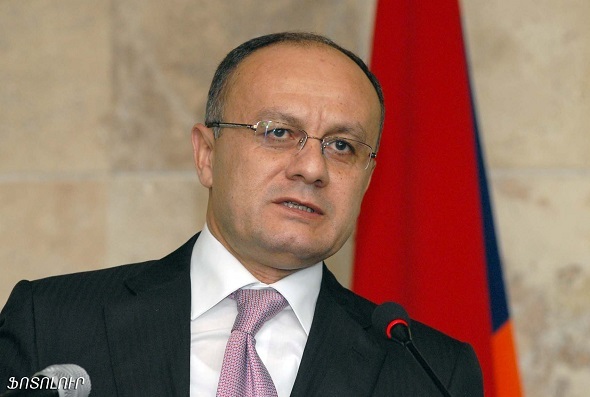 According to the Defense Ministry’s spokesman, Seyran Shahsuvarian, Ohanian thanked Cater for contributing to the improvement of NATO’s partnership with the Armenian Armed Forces, describing Armenia’s partnership with NATO as a vital means for Armenia to contribute to international security with its participation in peace keeping activities. Ohanian also met with Simmons on Sunday for talks on Armenia’s defense strategy and its military reform agenda. Ohanian and Simmons also discussed ways to promote regional cooperation.